Oncology patients often need long term central venous access for administration of chemotherapeutic drugs. The procedure below utilizes the 8 Fr Bard PowerPort, but the steps are generally the same for any type of port. Before starting the procedure, review the patient's history and recent labs, in particular the type of cancer, and any relevant imaging. If the patient is likely to have radiation to the right chest (for example, with right breast cancer), consider left chest port placement. Under ultrasound, visualize the right internal jugular vein, which should be compressible (unless thrombosed). The pulsatile carotid should medial/posterior. Anesthetize the skin with 1% lidocaine without epinephrine. Advance the 21G micropuncture needle into the jugular vein. If there is spontaneous venous return, advance the 0.018 inch microwire to the caba-atrial junction under fluoro. If no return but likely in vessel, attach connection tubing and aspirate. Dark blood should flow back easily. If bright red / pulsatile return, the needle is likely within the carotid artery, so withdraw the needle and hold pressure for 2-5 minutes. Once access is gained, make a skin incision along the needle and then blunt dissect using the curved Kelly. Exchange the needle for the 5 Fr micropuncture sheath and hub it. Remove the inner 3 Fr stylet and the micropuncture wire, holding your finger over the 5Fr lumen. Insert 0.035 in J wire and advance into the inferior vena cava. If the wire does not go straight down, consider whether it is in the aorta or in the pleural space. Take care not to irriate the atrium (will cause premature ventricular contractions). If difficult, ask patient take deep breath and hold, then advance. Make sure the J is facing right/posterior (take-off of inferior vena cava from right atrium). Once the J wire is in the inferior vena cava, ask for the port and catheter. Flush the peel away sheath, and the catheter itself. Mark the port pocket on the patient's chest (rule of thumb: 2-3 fingertips below the clavicle). Anesthetize the entry point, make an incision using a #15 blade, anesthetize the pocket and tunnel, then blunt dissect both. The incision should be just long enough to fit the port, usually about 3 mm extra on each side. Lidocaine with epinephrine can be utilized to minimize bleeding in the deeper tissues. The pocket should be deep enough so that the port sits on the pectoralis fascia. Attach the tunneling device and tunnel to the venotomy site in the neck. Pull the catheter such that about 15 cm are out at the venotomy site. It is easier to pull back the catheter later than to advance it. Cut the tunneling device and a small amount of attached tubing off, as it is sometimes difficult to manually remove the tunneler. Insert the peel away sheath and hub it. Pull out the inner obturator and wire. The valve should maintain hemostasis. Insert the catheter as far as possible through the peel away, then remove the valve and break the peel away sheath. Peel the sheath away while applying pressure to the catheter to keep it subcutaneous. Check positioning - pull back slowly until the tip is at the cavo-atrial junction. Cut the excess catheter tubing. Carefully attach the proximal catheter to the port and secure it with the fastener. Suture the port in place (optional). Attach a Huber needle and check that the port aspirates and flushes appropriately. Close the incision using 2-O absorbable suture for the deeper layer using inverted or reverse horizontal mattress knots, and then the skin with 3-O running suture. Use Dermabond at the venotomy site and over the port incision. If the patient is going directly to an infusion, leave the Huber needle attached and covered with a dressing. A common request for an interventional radiologist is placement of catheters, in particular a tunneled dialysis catheter (also known as Perm-A-Cath or Permcath). Here is one approach to placing the catheter via the right internal jugular vein. The approach utilizes an AngioDynamics dual lumen central venous catheter that measures 23 cm tip to cuff (28 cm tip to ports). Check the patient's height. If between 5 ft (150 cm) and 6 ft (180 cm), in general use a 23 cm tip-to-cuff AngioDynamics tunneled hemodialysis catheter. Once J wire in IVC, ask for catheter. Flush dilators, peel away sheath, and both hubs. Lay catheter on patient to judge where to make tunnel. The tip should be near the cava-atrial junction. Mark the tunnel entry point on the patient's chest (rule of thumb: 2-3 fingertips below the clavicle). Anesthetize the entry point, make an incision, anesthetize the tunnel, then blunt dissect the tunnel. 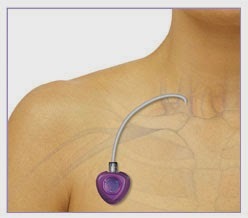 Attach the tunneling device and tunnel to the venotomy site in the neck. Pull the catheter all the way through to the hub. It is easier to pull back the catheter later than to advance it. Dilate the tract (12 Fr blue, then 14 Fr pink) under fluoro until the tip is at the level of the clavicle, then insert the peel away sheath and hub it. Check positioning - if at caba-atrial junction, fix in place. If too distal, pull back slowly while making sure the cuff stays within the tunnel. Flush both ports, give heparin (volume to give on hubs), Dermabond venotomy site, place biostatic pad on tunnel entry site, and then suture to skin with 2-0 silk. Fold a 4x4 and Tegaderm the port to skin. Variations on this procedure include measuring using the 0.018 inch wire to get an exact length for the catheter to use and how long to make the tunnel. If the hubs do not flush easily, they may be clotted. Aspirate all the clot out first, then flush. The catheter is ready to use at the end of the procedure, but plans should be in place for the patient to receive an AV fistula by vascular surgery.